Mrs. Aisenbrey sends New Year greetings to the Berry School. She mentions that she and her class met and are sending a check to the school. 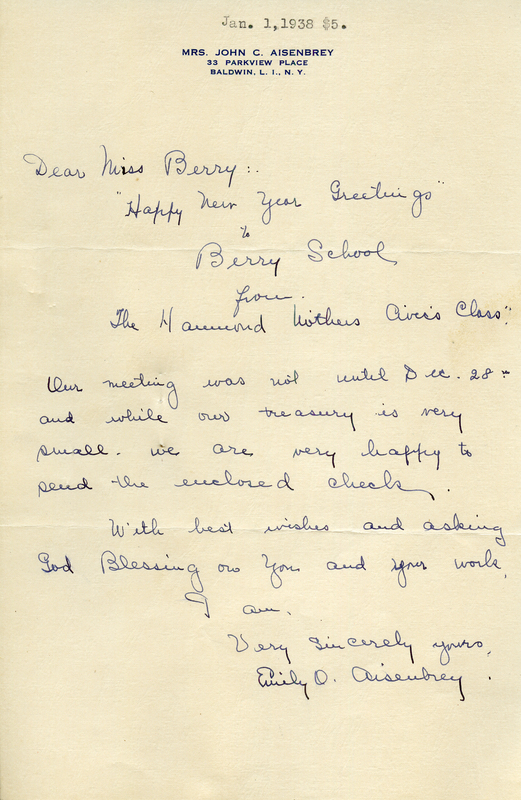 Emily O. Aisenbrey, “Letter to Martha Berry from Emily O. Aisenbrey.” Martha Berry Digital Archive. Eds. Schlitz, Stephanie A., Jordan Brannen, Cassie LaJeunesse, Jessica Hornbuckle, et al. Mount Berry: Berry College, 2016. accessed April 19, 2019, https://mbda.berry.edu/items/show/14281.